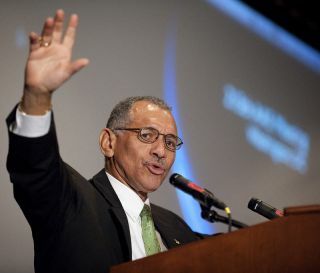 NASA chief Charles Bolden ispreparing to visit Chinesespace authorities. But the trip has met opposition from some lawmakersover itsintent to continue a dialogue on human spaceflight cooperation betweenthe U.S.and China. In an earlier exchange with Bolden,Rep. Frank Wolf (R-Va.) madeit clear he stoutly opposed any partnership with Beijing involvinghuman spaceflight,including efforts to involve Chinain the International Space Station. Bolden's China trip isset to begin Saturday(Oct. 16). In an Oct. 8 response to Wolf, Boldenemphasized that the Chinatrip is coordinated closely within the U.S. government "to ensure thatagencies and departments with an interest in NASA's activities withChina arefully informed and engaged," he said in a letter obtained by SPACE.com. Bolden emphasized that he haspersonally met with theleadership of the national security and foreign affairs community inthe U.S.to ensure the consistency of these exchanges with U.S. nationalsecurity andforeign policy objectives. That joint statement called "for theinitiation of adialogue on human spaceflight and space exploration, based on theprinciples oftransparency, reciprocity and mutual benefit." The statement also called forreciprocal visits between anappropriate Chinese counterpart and the NASA administrator in 2010. China is the third country, afterRussia and the UnitedStates, to develop and launch spacecraft capable of sending humans intoorbit.There have been three Chinese manned spaceflights since 2003 ? thelatest in2008, which included China's first spacewalk, as well as the country'sfirst three-personspaceflight. In other efforts, China's secondunmanned moon probe arrivedin lunar orbit last week. The country is also preparing to launch thefirstsegment of a Chinesespace station in 2011. In his letter, Bolden noted thatreceived a formalinvitation from the director of the ChinaManned Space Engineering Office. He said his travel to China on Oct.16-21 will include discussionswith a number of senior Chinese officials, including officials from theMinistry of Science and Technology, CMSEO, the China National SpaceAdministration, the China Academy of Spaceflight Technology, and theChinaAcademy of Sciences. ?While in China, I have also beeninvited to conduct sitevisits to Chinese human spaceflight facilities that were previously notofferedto my predecessors,? Bolden explained in the letter. NASA is also planning, Bolden said,to host a reciprocalintroductory visit by Chinese government officials to NASA facilities. "Any NASA plans to host this Chinesedelegation will beguided by the degree of transparency and openness that is displayedduring myvisit," Bolden said. Bolden assured Wolf that "under nocircumstances willthe visits (by Chinese officials) include the conveyance of anynon-publictechnical, operational, strategic or classified information." Bolden said that his visit isintended to be "introductoryin nature" and will not include consideration of any specific proposalsfor humanspaceflight cooperation or new cooperation in any other areaof NASA'sactivities. Bolden concluded in his letter that"NASA?s interactionwith Chinese entities will be in accordance with existing law andpolicy, andany specific future opportunities for potential cooperation will becoordinatedthrough interagency review prior to formalization with Chinesepartners."